Riccardo Egidi was on target again for Gate but this time it wasn’t enough for victory in this rearranged Hallmark Security League clash. 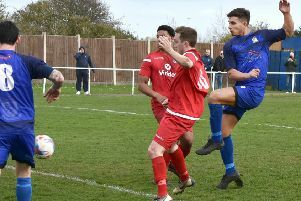 The striker had scored in Saturday’s 2-0 win over Runcorn Town and his goal at Northwich kept Gate in front for an hour but they had to settle for a point. Gate made just the one change, with Dan Gray coming in for Joey Mullen at right-back. They made a lively start as the in-form Egidi and Dean Ing pressed their hosts, though Gate keeper Max Povey had to be alert on 12 minutes to deny young striker Kyle Phipps. But Gate kept the early momentum and took the lead on 16 minutes, when Adam Sumner’s long throw found Egidi in the box. He showed his scoring instincts by turning to fire home from a tight angle. Callum Gardner had a golden chance to equalise on the half-hour but shot well over and it remained 1-0 at half-time. 1874 had won four of their previous six and began to show why in the second half as they applied pressure. But Andy Clarkson’s side defended solidly until the 75th minute, when Jack Irlam headed home a lofted free-kick. Neither side could find a winner and a draw was the fair result. Gate remain eighth in the premier division, three places above 1874, and visit second-bottom West Didsbury and Chorlton on Saturday. Gate: Povey, Gray, Sumner, Bamba, Davis, Staunton-Turner, Booth, Boyd, Akrigg, Ing, Egidi. Subs: Charnley, Seear, Pett.